I've grown up with cats and have been a pet parent for many years. I thought I knew most everything there was to know about cats and cat behavior. Boy was I wrong! I use Paws, Whiskers & Claws: The Feline Hospital as my veterinarian and as a staff member there, Ingrid has helped me countless times over the last 6 years. From using foraging toys to clicker training to teaching me how to administer fluids and shots, Ingrid's given me a wealth of knowledge about feline health and behavior. The most recent way she assisted me with her expertise was simply wonderful. I had recently moved from my apartment into a house. I'd moved with multiple cats before and it went smoothly each time. I knew to keep the cats in a safe room and make gradual introductions to the house. I knew to have familiar bedding and toys and other objects in their safe space. I knew to use Feliway plug-ins. But this move was especially difficult for my male tabby, Toonces. 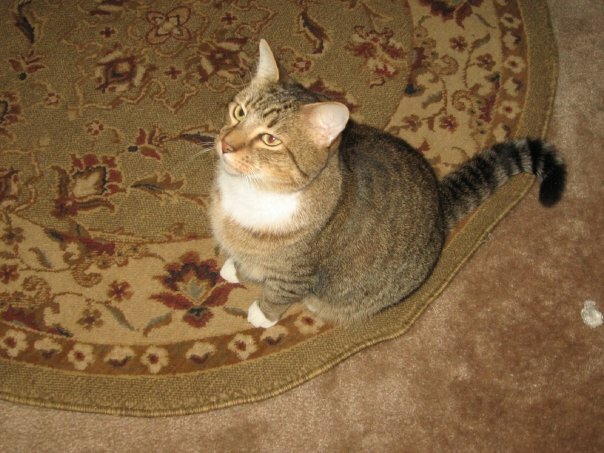 He was nearly constantly hissing and growling at the other cats, hiding under the bed, not using the litter box and not eating or drinking--not what I'd experienced when moving with Toonces in the past. I was so worried about him, and his behavior affected my other kitties. It was an incredibly stressful situation. Ingrid offered a plethora of suggestions and gave me great tips, such as separating Toonces from the other cats to give him time to adjust at his own pace. Putting her suggestions into practice made all the difference. Within a day, Toonces had stopped growling. The hissing was only occasional and he soon started eating and drinking again and finally used his litter box. Within 2 days, his behavior was back to normal and he was once again seeking affection. In fact, Ingrid's advice for helping Toonces helped all my other cats to calm down and within a week, they were all comfortable, relaxed and had full run of the house. They've been completely at home ever since. Ingrid gave me comfort in a stressful situation and her knowledge helped me to help my babies. If you are considering utilizing Ingrid's services, DO IT. You and your kitties will be grateful for it. Her services are worth every penny and it's an investment you won't regret.